May 13, 2012 - Bombardier Aerospace has made significant progress on its all new Learjet 85 aircraft. Work on the two first flight test aircraft and the complete aircraft static test article is well underway, with the production of hundreds of composite components, including the unique 32-foot composite pressure fuselage. The Learjet 85 is the latest Learjet development program by aircraft manufacturer Bombardier Aerospace. The program was launched on October 30, 2007 and a mockup of the aircraft was unveiled in October 2008 at the NBAA show in Orlando. 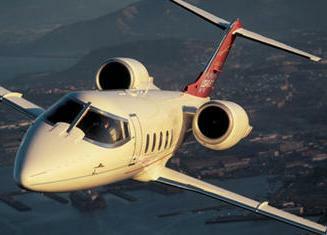 The Learjet 85 fits between the midsize and the super midsize segments of the market. It will be the first Bombardier Aerospace jet to feature a composite structure and will be Learjet's first composite structure business jet designed for type certification under FAR-25. The plane is expected to have a high-speed cruise of Mach 0.82 and a transcontinental range of up to 3,000 nautical miles (5,556 km). The joining of the nose fuselage to the main pressure fuselage, as well as the assembly of the aft fuselage, vertical stabilizer and tailcone fuselage sections, have all begun at the Bombardier sites in Wichita, Kansas and Quer?taro, Mexico. The first shipments of wing spars and skins, manufactured at Bombardier's site in Belfast, Northern Ireland, have arrived at the Quer?taro site, where wing assembly has started. Additionally, major supplier components, such as the aircraft's Pratt & Whitney Canada PW307B engines, are now on site at the final assembly line in Wichita. A ground breaking ceremony on April 30th marked the official start of the next phase of the Learjet Wichita site expansion plan, which includes building a new production flight facility, paint facilities and a new delivery center to support the Learjet 85 aircraft. "We're entering an exciting phase of the program," said Ralph Acs, Vice President and General Manager, Learjet, Bombardier Business Aircraft. "Our sites are moving full speed ahead and the production of the first flight test aircraft is progressing very well. We have solid momentum in all areas and it's great to see the focus and commitment of our Bombardier employees and suppliers worldwide as we assemble our first test aircraft and prepare for first flight." Initial bird strike development testing on the Learjet 85 aircraft has been successfully achieved, and over 85 per cent of the system supplier safety of flight (SOF) test rigs have been commissioned. The Learjet 85 aircraft is the largest, fastest and most capable Learjet aircraft ever. True to its legendary heritage, the Learjet 85 aircraft is set to deliver the extraordinary performance, superior technology and exceptional value Learjet aircraft owners expect. The jet is powered by two Pratt & Whitney Canada PW307B engines, each boasting 6,100 pounds of take-off thrust at sea level up to 86?F (30?C) and low noise levels, while the advanced low NOx emitting combustor offers reduced environmental impact. The aircraft targets a high-speed cruise of Mach 0.82 and a transcontinental range of up to 3,000 nautical miles (5,556 km). The Learjet 85 aircraft flight deck combines advanced technology with superior design elements for a cockpit environment unlike any other midsize jet. The latest in technological advancements and superior design aesthetics from Bombardier's Vision Flight Deck are carried over in order to create the ultimate Learjet aircraft flight control environment. The aircraft's Cabin Management System, developed by Lufthansa Technik, will feature a high-capacity Ethernet network, a digital amplifier to feed the high-fidelity speaker system and an interface to support the aircraft cabin environment, including lighting and temperature control. The system's open architecture also allows for easy integration of third-party equipment and new applications, such as high-definition features. The Learjet 85 aircraft's long-range cruise speed of M.78 with two crew, four passengers (200 lb each) and 100 NM NBAA IFR reserves. Assumes standard BOW, sea level departure and landing, unrestricted climb, cruise and descent with zero wind and standard (ISA) conditions en route.